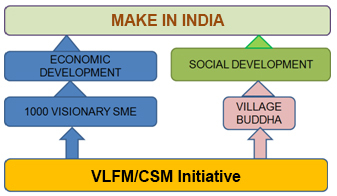 Visionary Leaders for Manufacturing (VLFM) Programme, now called Champions for Societal Manufacturing, launched in 2006 is a path breaking Programme started by Confederation of Indian Industry (CII) in partnership with Japan International Cooperation Agency (JICA), Government of Japan and National Manufacturing Competitiveness Council (NMCC), Government of India. Since 2014, this programme is now being coordinated by Department of Industrial Policy & Promotion and recognized as one of the Make in India initiatives towards supporting growth of Indian Manufacturing. It is one of the flagship programmes under the Joint Technical Cooperation Agreement signed by the Prime Ministers of the two countries. Having been declared a success by both sides, when the project came up for review after five years in 2013 the Governments of India and Japan agreed to continue supporting the Programme for another three years from April 2013 to March 2016. The Project once again came up for review in March 2016 and this support has been further extended for a period of three years. 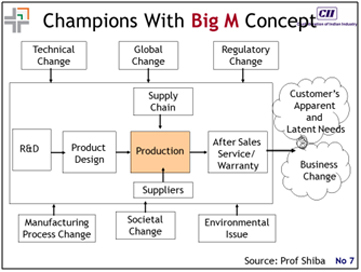 In 2013 it was given a new title “Champions for Societal Manufacturing (CSM)”. At that time its scope was extended and enhanced to address Societal Manufacturing. The objective of CSM is to develop winners for Breakthrough projects for the Manufacturing sector by building champions for societal manufacturing who can support the Make in India initiative of the Government. As a unique example of Government-Industry-Academia collaboration, CII and Academia, represented by IIT Kanpur, IIT Madras and IIM Kolkata are working together to build a pool of Champions for Societal Manufacturing and Visionary Leaders within companies to take India’s manufacturing sector to the next leap of growth. Five different programmes are offered under the CSM umbrella, each addressing the needs at different levels of management. In 2013, Village Buddha was added to align the manufacturing industry to address needs of the society. The aim of these Programmes is to bring about a Big M mindset – key for supporting the Make in India mission of the Government of India. The uniqueness of these Programmes stems from the Do & Demonstrate philosophy or the 70/30 principle that focuses on skill building rather than conceptual training alone and targets mindset change rather than tools and techniques only. A Japan Visit is organized for all Opportunity A and Opportunity B participants, every year, with support from the Japan International Cooperation Agency (JICA), under its cost sharing scheme. The overall objective of this module is to learn from the Japanese manufacturing system, see India from an “outside-in perspective”, closely observe Japanese culture and learn from the Japanese process-oriented society. The highlight of the Japan visit is the Self-Initiated Research (SIR), during which participants collect onsite data on various aspects of Japanese society and analyze these to gain insights on the success of the Japanese people. 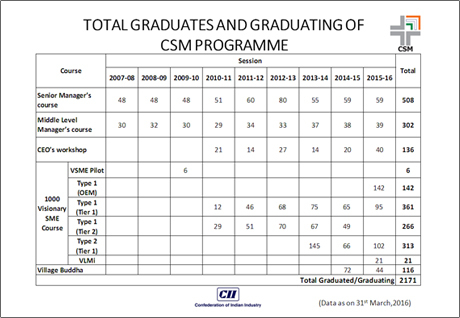 Over the last five years, the Programme has turned in very positive results. More than 200 success stories have been documented in areas such as New Product Development, New Markets, New Business Processes and New Business Models. Some of the key achievements some of which have received worldwide recognition include Godrej Chotukool, Kirloskar Brothers Submersible Pump, TechNova Printer and Sona Koyo EPAM. Thirty-two publications have been developed for the benefit of the Indian Manufacturing Industry. Having created a movement to transform Indian Manufacturing, the next leap was conceived to be oriented towards inclusive growth and CSM is supporting the present Government’s Make in India initiative. The two programmes through which inclusive growth is being driven are the 1000-VSME Programme and the Village Buddha Programme. Village Buddha, a unique programme, is aimed at developing a strong relationship between Businesses and Society to create a Win-Win for both. A first of its kind Programme developed under the aegis of CSM, it addresses opportunities arising out of the rapid changes taking place in India’s villages. Over the last ten years, life in Indian villages has undergone drastic change. Some of these changes have been triggered by an almost 100% penetration of mobile phones and TV. Over 90% village children have access to basic education. These changes continuously create new emerging markets and future business growth opportunities. The Village Buddha programme acknowledges that these opportunities are being addressed in India in many ways through philanthropy and by creating new business models. Village Buddha was launched in September 2014 in Bangalore at the TVS Institute of Quality & Leadership in Anekal (near Hosur, Bangalore). The TVS Group supports the programme and have created a special classroom necessary to conduct the training sessions based on the 70:30 principle. 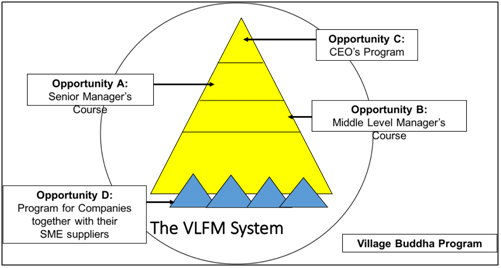 By March 2016 the VLFM / CSM Programme had developed over 1900 visionary leaders from over 1000 companies. The table below shows details of Visionary Leaders developed through different streams. Going forward, CII and JICA are engaging in making the CSM programme more relevant, impactful and sustainable, to create the next wave of transformation of Indian Manufacturing.